This is the ground tray literally 1 minute after putting out seed! Hi Sharon, I missed the previous two posts due to not updating my sidebar with your new address but I have rectified that now. Glad the Hedgehog recovered after your ministrations. 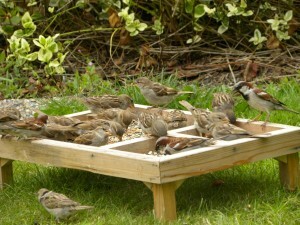 Those Sparrows certainly like their dining table! I don’t see anywhere near as many in my garden as I used to. Hey sharon, I’ve got about 16 house sparrows out the back of my garden. They were eating a feeder of seeds each day and it was too expensive! So now there’s just a mesh feeder with peanuts which they also seem happy with – which is good cos the peanuts are cheaper and seem to last longer. I’ll get them some seeds again though as theres more nutrients for them in the seeds. Great photo of the HS’s at your seed feeder.